Moon Knight, oft described as a Batman clone, has had a long but relatively undistinguished career at Marvel Comics. Personally, I’ve always felt the Batman clone comment was unfair; yes, they’re both superheroes who are millionaires and mostly fight at night, but otherwise, the similarities are pretty nonexistent. I mean, Wayne’s loyal butler is English and Moon Knight’s is French; I don’t see how their lives could be more different. Moon Knight is Marc Spector, a mercenary and soldier-of-fortune who fights another mercenary named Bushman, and loses badly. Left for dead in the Egyptian desert, he is rescued by devotees of Khonshu, the Egyptian God of the Moon and Vengeance. Unconscious and near death, Spector has a vision in which Khonshu appears to him and offers him a new chance at life if Spector will be Khonshu’s avatar on Earth. Spector agrees, his life is saved and, when he returns to the United States, he creates the Moon Knight identity. Not a bad origin, although, as mentioned, it hasn’t led him to much success in the Marvel Universe. Perhaps he should have surmised times would be tough when his first appearance was in Werewolf by Night, one of Marvel’s titles in the 1970’s which tapped into the horror market. This was in 1975, and after that appearance Moon Knight jumped around the Marvel Universe a little (even joining the Defenders for a few issues), until finally securing his own series in 1980. Doug Moench and Bill Sienkiewicz chronicled these adventures and, while the book was critically lauded, it didn’t do wonders in sales, and was cancelled in 1984. Since then the character has appeared in numerous one-shots and limited series, and has also received other chances to carry an ongoing series; he’s currently on his fourth. None of these series have been spectacularly successful, although all have had brief flashes of fame. 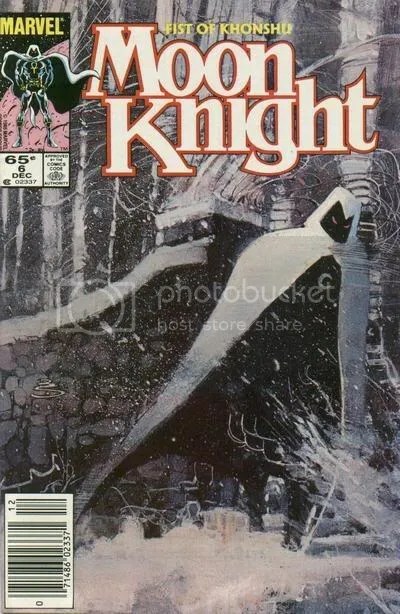 Normally, it is the artist that seems to make the public take notice of a Moon Knight comic; Bill Sienkiewicz was in the beginning of his career when he pencilled Moon Knight, and it helped to push him into the spotlight; Stephen Platt was his penciller in the mid-90s and was quite a hit with those who enjoyed his very Image-esque art style; and his current series started off strong with pencils by fan-favorite David Finch. Oddly, while Doug Moench, his co-creator and original writer, gets some credit for his early stories, most other writers are rarely thought of in connection to the character. Perhaps one of the reasons for that is Moon Knight’s striking visuals. His costume is distinctive and jumps off the page at the reader; the flowing cape and the contrast between the white of the costume and the dead of night work together to make Moon Knight a character to remember. However, his personality often seems to be ignored in the rush to focus on his visual representation, and I’m not sure that’s wise. The character actually could be quite interesting, if properly developed. So, the question before us for the next few days is: How do we make Moon Knight the interesting and successful character he has always had the potential to be? Nail on the head with that last paragraph. Sienkiewicz set the tone for every Moon Knight story that will ever be published. I’m not saying that’s a bad thing. At the time, his style was quirky and gritty and maintained a certain level of darkness and chaos. The art had a quasi-supernatural feel to it which fit the character’s design and his backstory well. I think Finch did a nice job in capturing that roughness in both his posing and his costume design. The only problem (and it’s a big one) is that Moench’s ideas were a bit ahead of their time. See, Marc Spector was a mercenary and he realized that he was no Clark Kent…meaning that it may be obvious to the fine folks of Chicago that Spector and Moon Knight are one in the same. So, he takes the blood money he has earned and invests it, becoming a millionaire. He then creates the identity of Steven Grant to rub elbows with the upper crust folks. To keep up with what’s going on at the ground level, he also creates the identity of cab driver Jake Lockley. Let’s recap that. We have Marc Spector the mercenary, Moon Knight the superhero, Steven Grant the rich dude and Jake Lockley the common man…all in the same body. Helping him with this marvelous charade are his pilot/butler Frenchie and Marlene, the daughter of an archaeologist he tried to save from Bushman’s greed. It was a brilliant concept that allowed Moon Knight to mingle in different social classes without anyone suspecting his true alter ego. Imagine the long sleepless hours, the precise yet hectic schedule and the general confusion this kind of lifestyle would create. The story potential was limitless. Unfortunately, the series was cancelled after only 38 issues. So that’s the first reason behind the character’s continued wading in the bottom-feeding realm of Marvel’s cast. But I’ve got another pretty valid reason too: his rogues gallery. Check out this short list of villains that he has faced throughout his adventures: Bora, Bushman, Coachwhip, Commodore Donny Planet, Conquer-Lord, Flag-Smasher, Grand Bois, Hatchet-Man (his brother Randall), Hobgoblin, Jester, Karg, Killer Shrike, Master Sniper, Midnight Man, Morpheus, Phantom Rider, Ringer, Secret Empire, Sons of the Jackals, Stained Glass Scarlet and Werewolf by Night. Not exactly any Ali-Frazier matchup in the bunch, huh? And let’s not forget that he’s been killed at least three times during his career too. I don’t want to make it sound like that’s a unique thing in the comics world, but when your character isn’t in a top tier book a needless death/resurrection thing can really throw off sales. Basically, it comes back to the tenets John and I espouse for every revamp we detail. 1. You need a unique selling point. In this case, Moon Knight had it with the multiple personalities. 2. You need a strong supporting cast and some relevant foes to fight. The former was taken from him while the latter never developed. And finally, 3. You need some consistency. Stick with it. Make something of it. In Moon Knight’s latest ongoing series, writer Charlie Huston brought the character out of a self-induced exile and revealed his waning faith in Khonshu, his apparent addiction to prescription painkillers and the trouble he’s having rebuilding past friendships. That’s all a great start. He’s even hallucinating from time to time. Great! The only thing I wanted to see more of was some sort of mental imbalance from trying to play so many different characters throughout his career. Unfortunately, the later issues of Huston’s run have turned into a stream of brooding heroes and punching contests. He did re-introduce Midnight, the poorly-conceived sidekick that was foisted upon us all during the second Moon Knight ongoing title, but that whole plot turned into a watered down version of the Miracleman/Kid Miracleman dynamic. There’s more to say here about direction and mistakes and missed opportunities, but I’ll turn it back over to John for now. What can be done to re-energize this property? Can Moon Knight be made into a top player in the Marvel Universe? Should he be? Well, making Moon Knight a top player in the Marvel Universe suggests making him front and center in the Marvel Universe, and I’m not sure that’s a good idea. I enjoyed the issues when Moon Knight was in the West Coast Avengers, but it never truly fit the character, and he always looked out of place with the team. In addition, because the Avengers rarely run around during the evening, he was forced to fight a lot during the day, and amongst the rest of the team, he just became another costumed hero. I don’t have a problem with him being an associate of the hero community, but I think he should be on the edges, and if he gets involved in things, he should be allowed to do things his way. I’d recommend few guest stars in his book, at least from the heroes and those that do drop by should expect to be dragged into Moon Knight’s world, rather than vice versa. That being said, I truly do like the character. I’ve perused a few issues of the current run, and honestly, I thought they were practically unreadable. I found them to be full of mopey, over rendered characters speaking in tortured prose that made absolutely no sense. I read three issues in a row, and never really knew what was going on or what the character’s motivations were. The art was, I believe, attempting to be dark and moody, but sadly was simply dark and ugly (this was after Finch left the title). I was very disappointed, because I did enjoy Moon Knight and thought that a lot more could have been done with him. The multiple personality bit was brilliant, and I enjoyed the fact that it could serve almost like a superpower in some cases (at one point during Moon Knight’s tenure as a West Coast Avenger, the villain Dominus paralyzes the Avengers by affecting their minds; Moon Knight is immune, because every time Dominus hit him with the ray, it just knocked out one personality, and another was always there to take over). However, I never saw the downside to the multiple personality really explored, and it needs to be. The man is at least three different people and there are literally hundreds of issues worth of stories that could be written on that premise alone. I also believe that the visual style of the character is very important. The demands of it are not easy for any one artist to draw, especially if you play up the multiple personality aspect of the character. The world of Moon Knight is a dark place, and it needs to be drawn dark, but still readable, straddling that fine line between a horror book and a superhero book. Steven Grant’s world is that of high society; it’s bright and well lit and needs a different feel. Jake Lockley is more of a dark, noir feeling, since he’s on the streets with the people. Finally, Marc Spector is a straight up action mercenary, so a cleaner action style works best for him. To really emphasize the different personalities, you really want to portray their lives in distinct styles of art, which is going to be difficult for a lot of artists. There are some who could do it, although it might be best to hire two or three different pencillers, or to have different inkers working over one penciller to really make the book look unique. The differing artistic styles could seem jarring, but I think they’re necessary to really get across the fact that there are so many different people in Moon Knight’s head. Even with that being said, we still have to work on his supporting cast and his rogues gallery. I think his supporting cast has potential. Marlene is a gorgeous woman who’s been shown to be strong as well. The interesting thing to explore there is how does Marlene love a man who is actually four different men. Does she love them all? Just some of them? How can she help him integrate his four personalities into one? (For that matter, does he even want to integrate his personalities?) What kind of woman can live like this? I also think that Frenchie could be used more. He’s run quite the gauntlet, and has been beaten up and paralyzed numerous times over the years. They’ve also recently decided that he’s gay. He’s Marc’s oldest and only true friend, and he needs to have a place in the series. He’s not just an “Alfred”, but a very involved participant in Moon Knight’s activities, with a long history of experience as a mercenary and the mechanical expertise to keep Moon Knight’s gadgets working. The rogues gallery though? Yeah, that’s going to take a bit more work. The thought of having more than one artist on an ongoing Moon Knight title is not only brilliant, it’s practical. Sure, setting the right mood is important for the book. What may be even more important to the success of the book though is its schedule. Marvel is notorious for its lateness. Having multiple artists means less pages for each and could (if everything is planned well) result in a shorter completion time. Of course, if one of the artists falls behind, then it could also spell certain disaster. It’s tricky. I agree that Moon Knight needs to stay on the fringe. And the idea of visiting heroes adopting his tone is crucial. It’s like what we talked about with the horror setting. You need consistency to pull that stuff off correctly. Spider-Man is a good fit. Punisher may have his place. And Daredevil seems to work on the same outskirts of the Marvel Universe. Hulk? Not so much. Iron Man? Too techy. And the team thing is right out the window. The multiple personality aspect HAS to be brought back. That’s what made him different from Batman. He actually played different roles all the time and it didn’t seem silly (Matches Malone, anyone?). Plus, it gives the opportunity to wonder which one is the REAL character. So many ways to play that theme out. His supporting cast is small but important. Frenchie gives support and Marlene grounds him somewhat. I think there’s a big opportunity to expand the cast though…add some tension. The rogues gallery has me stumped right now. One would think that his archenemy should be Bushman, but there’s absolutely nothing interesting about the character. He’s just an angrier version of Marc Spector. No, Moon Knight should be dealing with the more shadowy types. Conspiracy theorists. Twisted religious causes. Human trafficking. Back alley genetic experiments. The kind of overtly creepy stuff that the other heroes don’t want to get their hands in, let alone acknowledge. We’ve established a general tone and at least one or two things to explore. You want to take a stab at the rogues thing? Maybe throw some names out and I can see if I can make them fit? Other ideas for expanding the supporting cast? And didn’t we make mention, during our Go West musings, that we would relocate him back to Chicago? Is there something we can do with that? I’m going to start by discussing the rogues, since I think we agree that a hero stands or falls on the strength of their Rogues Gallery. You mentioned some of the people he has fought in the past above, and I’ll start with them. I should make sure I agree with you on Bushman first though. Bushman is, quite simply, dull and uninspired. The only reason he’s stuck around is because he was part of Moon Knight’s origin, but that ship has sailed. Time to use a better class of villain. My first pick for a member of his Rogues Gallery would be Killer Shrike. I’m well aware that Shrike has never had a large role in the Marvel Universe, and this has puzzled me for some time. First of all, I like his visual look, and in the Moon Knight title, that’s important. He has a neat, streamlined look, with a nifty cape. The colors of his costume are dark, and he’d fit in quite well in a darker, moodier comic. Killer Shrike may need an attitude adjustment, or perhaps we simply need a new Shrike, which should be easily accomplished. Visually, I think Shrike is as close to Moon Knight’s opposite number as currently exists. Another possible villain for him would be Hobgoblin. I fully understand that Hobgoblin is seen as a Spider-Man villain, but with the Green Goblin back among the living, Hobgoblin has faded from the scene in the Spidey titles. Let’s give him a new lease on life with Moon Knight. Again, Hobgoblin has a great visual look and is actually a rather scary looking bad guy; I’ve always felt he was a much more menacing villain than the Green Goblin. There have been quite a few men behind the mask of the Hobgoblin, and we could use any of them, or create our own Hobgoblin. Or, if we simply must keep Bushman in the picture, make him the new Hobgoblin. He wouldn’t be the first mercenary to don the costume, and you can retain the connection he has with Moon Knight and reinvent Bushman as a more interesting villain at the same time. Sadly, Moon Knight’s past foes are really rather pathetic (although this could be a place to use the Ringer I mentioned in our “Building Better Villains” posts over Halloween), but I did notice Coachwhip. It’s no secret that I’m a huge fan of the Serpent Society, and perhaps we could gather a few of their former members (including Coachwhip) into a smaller Serpent Squad to bedevil our heroes. Most of them are fairly freaky and would work in an edgier story. After that, I fear we’ll be creating villains for Moon Knight. It might be interesting to create at least one villain that’s seen more often for one of the other identities. For example, a corporate bigwig who runs in the same circles as Stephen Grant could be interesting. He could either be a true villain who simply likes to run with the jetset or he could be more of a weak man, who does bad things because he needs to in order to maintain his lifestyle. The interest would be in seeing how Moon Knight handles him when this guy stumbles into that area of Spector’s life. It could be even more interesting as Moon Knight’s personalities begin to overlap; he can normally keep them separate because their worlds are so different. What happens when those worlds touch? How do his personalities interact when someone crosses from one life to the next? After your “time to use a better class of villain” comment, I can’t believe I’m actually going to say this, but the selection of Killer Shrike as a main foe is brilliant! I feel dirty inside. To tell the truth, Shrike and Moon Knight have a lot in common. Both were mercenaries before they became costumed types. Both have generally succeeded on their own skills, with the exception being Shrike’s powered armor. And both have pretended to be something they’re not…Shrike has actually posed undercover in a number of criminal organizations. To take it a step further, there’s the topic of vengeance. In one of his earlier adventures, Moon Knight faced Shrike (with Ringer and Coachwhip) who managed to shoot down the Mooncopter (don’t laugh) and nearly kill Frenchie. Shrike was never punished for that daring act. Now pardon me for a minute as I digress into another revamp, but I think we need to update Killer Shrike as well. I don’t mind the guy in the suit. He has that military background and extensive experience working in the underworld with various unsavory types. However, he has a few faults too. First of all, I don’t know about the cape (or the goofy plume on his head…if he still wears it). I could picture some sort of wing-like thing similar to Black Bolt’s costume. Secondly, his name is just silly. Can we drop the “Killer” part and just call him Shrike? I mean, from a scientific stance, all shrikes are killers. They’re creepy little birds (also referred to as “butcher birds”) that like to impale their prey on thorns or sticks. Why can’t we adopt some of that nastiness in his characterization? If Marvel wants to have a more visceral, ground-level title, this could definitely be it. Your next pick was Hobgoblin and I have to disagree with you. As much as I like his look (even with its similarities to Moon Knight), in my mind he is inexorably tied to Spider-Man. Each man behind the mask had some sort of tie to the Spider titles and most of Hobgoblin’s encounters took place with Spidey. If we took the character and put Bushman or another meaningless person under the cowl it really wouldn’t make sense or be an original story. That’s a dead end to me. I would suggest we could use Demogoblin, because he had a previous run-in with Moon Knight too. However, I think his demonic origin may be a bit too “out there” for a grounded title. Let’s just skip the whole goblin subset. Coachwhip is an interesting possibility. And she would add a villainous female to the ranks. I would absolutely LOVE to construct a new Serpent Society and the Moon Knight ongoing series is the perfect place to present a darker, dirtier lineup that could become involved in some of the less-flashy types of crime I mentioned earlier in the post. I’d include some of the members with interesting names and powers like Boomslang (which is actually one of the most venomous snakes in the world), Puff Adder and either Sidewinder (useful powers) or Cobra (creepy powers), plus create a couple new ones perhaps based on snakes like the Keelback, Lancehead and/or Pit Viper. As far as creating new villains goes, there are a lot of options. The one you mentioned seems like a sort of Kingpin/Norman Osborn thing…which is an expected, though not altogether horrible, direction. Although I must say that “The Committee” sort of serves that kind of purpose for him right now (without the personality involvement you mentioned). It would be intriguing to have a bad guy who Moon Knight encounters in his various personas…a ruthless tycoon that gladhands with Steven Grant then badmouths Jake Lockley as the lowly driver. It would be kind of cool to demonstrate how someone like that acts when they have to interact with those they deem below them. Of course, this same guy might look up to Marc Spector and need to hire him for some nefarious scheme. I could also see us creating a sort of anti-Moon Knight character as perhaps the champion of another Egyptian God, one that is in conflict with Khonshu (and, as an aside, didn’t the Serpent Society pal around with a version of Set – the Egyptian God of chaos?). Or perhaps we could set up an underground group that worships a different interpretation of Khonshu and is at odds with Moon Knight (sort of like radical Islam versus traditional Islam). That’s one direction. I’m all for making Killer Shrike simply Shrike, since that’s less typing. Let it be done! Actually, I agree with everything you mentioned about him, and truly believe that he could be a first class villain for our hero. I could disagree with a lot of your Hobgoblin comments, and while I agree that he’s tied to Spider-Man now, I don’t think it has to stay that way. After all, Sandman was another villain tied to Spider-Man, who moved over to become a Fantastic Four villain, and of course, the Kingpin was every inch (and he has many inches) a Spidey villain, who’s now more universally thought of in connection to Daredevil. These seem odd at first, while a reader’s mind adjusts, but soon the villain becomes associated with their new antagonist. I’d also point out that Jason Phillip Macendale, one of the Hobgoblins, was very pragmatic and I think he’d be happy to continue his criminal career avoiding Spider-Man. I could make these arguments, but I won’t. I’m more than willing to concede the Hobgoblin, mostly because you like the idea of a new Serpent Society! I like the concept of keeping it smaller, with more like 5 or 6 members, rather than the 15 or 20 they had at one time. I think the character of Sidewinder is a fascinating one; he had gone straight, I believe, to be able to spend time with his child, but there are many ways to bring him back to the bad side of the street. That being said, I’ve also learned to like Cobra, a character that I never thought much of. Mark Gruenwald really fleshed him out during his Captain America run, and I think the Cobra would be very interesting; combining him in a group with Sidewinder could lead to some clashes, since both of them led the Serpent Society at times, and the two of them aren’t getting along right now. While I recognize the cliche of the evil businessman, I think a character that can interact with all of Specter’s personalities is too valuable to dismiss. Besides, we don’t have to make this character a ruthless planner, which does tend to be the stereotype. Instead, he could simply be a weak willed man, who is desperate to hold onto what he has and will do reprehensible things to retain his wealth, his power, or maybe even his wife. Perhaps his wife is shallow and vain, and will leave him if she doesn’t get the jewels and valuables she covets. Perhaps the man is a city politician who had a skeleton in his closet, and was determined to hide it during a re-election campaign. He was forced to associate with less than reputable people to accomplish this goal, and unfortunately, he opened a door that he has not been able to close, as these people continue to force him into other actions or risk losing his political clout under a scandal. Perhaps he’s a young man who’s running his parents’ business, and not doing a very good job of it, and is willing to do anything to keep the business solvent so his parents won’t be disappointed. My point is, we don’t have to use the Norman Osborn archetype for this character if we don’t want to. As for a secret organization, like the Committee or the Secret Empire, I like the thought of one, but the reality always seems to fall far short. In the end, they seem to either have no personality and/or very nebulous goals. If we were to use such an organization, we’d have to know exactly why they were formed and what their motivation is, and I’d want to detail out at least a few prominent members so that we had some personality we could infuse into their appearances. I think one of the main problems with the Secret Empire is that everyone has their identity hidden by those bloody faux Ku Klux Klan robes they wear. Normally the identities of the important members is a secret to the reader, as they’re someone the writer wants to reveal down the road, so they aren’t given personalities, in the fear that this could clue the reader into their true identity. Phooey! I say give them individual personalities; it makes the organization so much more interesting than any minor mystery about who’s actually hiding behind the hood. A counterpart to Moon Knight, embodied in the avatar of another Egyptian deity? I can see that. The only other Egyptian deity that ever regularly appears in Marvel comics (and certainly the only evil one) is Set or Seth, depending on who’s writing him. You mentioned tying him into the Serpent Squad, which would make sense, because of the snake motif. However, we could also go with Sekhmet, a lion god that has fought the Avengers and the Black Panther. Even more interesting could be using an avatar of Anubis, the Egyptian god of funerals and mummification. In fact, Moon Knight had a run in with one of his priests already. A modern day priest of Anubis, Sheikh Ahmad Azis declared himself the reincarnation of Aram-Set and named himself Anubis the Jackal. He was killed in a confrontation with Moon Knight, way back in the first issue of his second series. Perhaps this Sheikh actually was connected to Anubis, and Anubis annoints someone else as his avatar to get revenge for the Sheikh’s defeat? So, we have Shrike, a new Serpent Society, an unscrupulous businessman, a new Committee or Secret Empire (choose your favorite) and an avatar of a rival deity. That should keep Moon Knight busy, and the other heroes won’t laugh at his Rogues Gallery anymore. What about his supporting cast? Do we stick with just Marlene and Frenchie? Your idea of having a Set-based avatar running alongside the Serpent Society makes me chuckle. Not because it’s a bad idea, but because it reminds me of Cobra and their dealings with Serpentor. Ridiculous. There are, however, some interesting paths to explore in the Egyptian pantheon. And I think that stuff could be mined to great effect. Also, I think one way to expand his supporting cast would be to introduce some sort of native guide or foreign professor steeped in the mythologies. If it were a guide, it could be someone who is determined to serve at Moon Knight’s side, in honor of Khonshu, and that would lead to some funny encounters with Frenchie as they both try to help Moon Knight. Perhaps the professor type could be female and Steven Grant could meet her at a museum fundraiser…the two of them hit it off and he uses her as a resource. I think we have to be careful to build up his alternate identities and make at least one of them strong enough to stand on its own. That’s another Batman trap we don’t want to fall into, where the costumed character is a bigger presence than the man under the mask. Frenchie and Marlene should be the all-time core of the series. Building up both of their personalities apart from Moon Knight will help strengthen the storylines overall. And we can have supporting cast members bloom out of those characters too…Frenchie’s new boyfriend or a new love interest for Marlene that ends up being part of our new Secret Empire. The multiple personalities give us a lot of chances to introduce new characters, both useful and disposable. I’m interested in the move to Chicago. There’s already an established image of political corruption there, which would lend itself to some sort of evil underworld. Crime has been up in the city recently as well. The Serpent Society might set up house there, seeing it as ripe pickings and new stomping grounds away from a gaggle of heroes. The Windy City backdrop gives us an easy in for pretty much everything we’ve talked about so far. I’m certainly all for moving him to Chicago; think how cool his cape will look in the wind out there! I also like your idea of an expert in the Egyptian pantheon. One thing to consider about his supporting cast touches on something you mentioned, which was that we wanted to make sure his secret identities are all strong characters in their own right. By doing that (and I agree that it’s essential that we do it) we create a situation where Moon Knight almost is his own supporting cast. We now have a book tracking seven characters, if we include Frenchie, Marlene, our new expert, and all of the four Moon Knight personas. It also would probably be wise to introduced a few supporting characters for each personality who don’t deal with any of the other sections of Spector’s psyche. For example, Jake Lockley might have a few informants who only ever deal with him; Spector would have a few mercenary contacts and Grant would have some high society friends. We’d need a few recurring characters for each of these personalities if we’re going to sell them as independent of each other. I would see the structure of the book being similar to the Green Lantern title that DC produced back in the early 90s; one story arc would deal with Hal Jordan, then one with John Stewart, and then one with Guy Gardner, with occassional stories involving them all. Of course, Moon Knight would always dominate the book, but I could see one story arc putting more focus on his Jake Lockley persona, and then another spending more time with his Steven Grant side….that sort of thing. The first story arc would have to introduce all of the personalities to the reader, but there would be plenty of time to flesh them out down the road. Hmmm. We covered supporting cast and villains; we’ve discussed how to structure the series, and what we think the important beats are….did we forget anything? Well, I don’t know if you have any opinion on it or not, but I think we should do a quick examination of Moon Knight himself and see what works and what doesn’t. As things stand, he’s pretty much Batman in white. We’ve talked about increasing the presence of his various identities, but we haven’t discussed what we might change about the guy in the fancy outfit. Does he have any sort of powers? What are his limitations? Does he rely on painkillers to get through his adventures? Is he a gadget hound? Does he have a Mooncycle and a Moonmobile and a pair of Moonskates? Let’s do a quick inventory of what makes Moon Knight tick. I would like to see his “lunar-reliant” abilities make a return, not necessarily in reference to the various phases (though it would be cool to remove any additional powers during a new moon and have his powers go overboard during a full moon) but more in the “better at night than in the daytime” sense. He could be similar to a werewolf but without the creepy transformation. Honestly, he looks ridiculous fighting in broad daylight but the full whiteout effect would be pretty effective at night. I think his painkiller addiction should be front and center in dealing with all of his various identities. The drugs will color his entire life, but each alter ego will handle it differently. And the gadgets have to go. I don’t mind him having some sort of staff or a couple bladed weapons that may have been given to him by followers of Khonshu. However, the mass-produced throwing weapons and the helicopters and submarines and dirigibles have to go. I don’t like the “funded by a millionaire” quality of the character. It makes him too much like Batman. He should be more of a ground-level hero…relying on his skills and his environment to take out the bad guys. I agree that returning to him his Khonshu derived might is a good idea. If he’s Khonshu’s avatar, he really should get something out of the deal, and I love the idea that these abilities are dependent on the phases of the moon. Ditto your feelings about the powers perhaps getting a little too strong and out of control during the full moon. As for gadgets, I think he has to have some. I mean, he is a millionaire, and surely he does something with his money. I wouldn’t give him a utility belt and a submarine, but I’ve always liked his flying Moonjet (or whatever he calls it) and it does provide him with transportation, which every hero needs. However, maintaining that would probably be expensive enough; certainly I think he should fight with his traditional weapons, like the ankh. I will admit that the painkiller addiction seems a little too Desperate Housewives to me. I’m not fond of it. That being said, it makes perfect sense; how would a human who gets beat on as much as he does, with no real powers to speak of, survive that sort of pain. Of course, if we’re returning a measure of superstrength to him with his Khonshu given powers, would he still need the painkillers? I’m thinking that, when the moon is waning, he would need them, since his powers are at their weakest. However, for much of the rest of the month they wouldn’t be as necessary; of course, he’s addicted to them, so he’s taking them all the time. Do they interact with his powers? If he breaks the addiction, what does he do at those time when his powers aren’t strong enough, and he needs relief from the pain? There is some potential in this concept.